The saying goes “Every day is a school day”, and I really think that’s true, or certainly should be true. 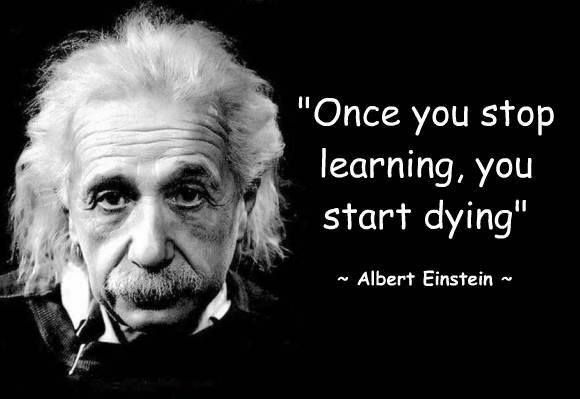 Maybe my teaching background means that this rings much truer for me than for others, but I feel so strongly that no matter how old you get, you should never stop learning. It keeps your mind active, it helps you discover new things, and most importantly it keeps you interested in what goes on in the world around you. I’ve written before about doing something which fulfils you, and how many people I come across who would go so far as to say that they hate their job and they hate going to work. I’m a primary school teacher, that’s my qualification and where the bulk of my working experience lies, so maybe I’m more keen to learn than others because I watch others learning every day, but I have come across more teachers than I can count who are 100% set in their ways, unable to learn new skills or techniques and worse than that, completely unwilling. And these aren’t just the ones that have been slogging away for 40 years in the same job, these are teachers from young to old, thinking they know best and without even the slightest inclination to change. This is despite the fact that everything is constantly evolving and improving, from teaching resources to methodology to technology. I really feel like the best teachers (and this could possibly be generalised to any profession…?) are the ones who are hungry to learn more, discover new techniques, find new ways of teaching the same old boring concept, and most importantly, want to try new things. If you stand still, teaching the same thing year in year out, with no variety and no excitement, you will drive yourself insane and more importantly, you will get bored. Boredom leads to grumpiness, a lack of enthusiasm and inevitably towards a permanent ‘can’t be bothered’ attitude and a lacklustre approach to life. But I digress. My point here was that you should always be learning. Staying stagnant is boring and if you find going to work boring, pointless and mind-numbing, you’re in the wrong job. Like most primary school teachers, the thought of teaching secondary school children fills me with a slight dread, purely because I’m so used to the younger kids. But I think it’s good, even essential, sometimes to have a go at things that you might not find easy, so I recently enrolled in an advanced TEFL course, which when completed will more than likely mean I’ll be teaching English to all ages, from children to teenagers, to adults. Quite the leap from primary kids! Why? Not necessarily because I want to become an English teacher, I don’t need another teaching qualification. But perhaps to learn something new, take on a new challenge, add another string to my bow? I wasn’t sure how I’d get one with it, but I have to say I am absolutely loving it. I’ve taken on my first private student and although currently quite time consuming, I am thoroughly loving the challenge of having to plan lessons, search for resources and teach something new. It’s so far removed from what I’m used to, and bizarrely, that’s why I love it, because it’s new, and it’s tough. Staying still is the easy option. It requires no thought, no change, no effort and no difficulty. People like to stay within their comfort zone, which I completely understand, but sometimes, just sometimes, it’s a good idea to step outside of that and do something which may have previously seemed terrifying. It’s amazing just how fulfilled and happy it can make you feel. Previous postFriday thought #22 First powder day of the season!! Next postFriday thought #24 Cheesy winter food!